"If you're among the 34% of Americans who have seen wrongdoing at their job, you may want to add this book to your Christmas wish list. Please Note: There are different shipping options available. Please make sure to choose the one that best fits your needs and price range. Every single day, American workers by the thousands report fraud, violations of environmental rules, health and safety hazards, and political corruption. The National Business Ethics Survey reports that 56% of workers admit to witnessing serious misconduct at work, and more than half of them take the first step to report it. But there exists a maze of confusing state and federal laws that govern whistleblowing. Ignorance of the proper steps to expose wrongdoing too often leads to silence, lost court cases, public embarrassment, and a failure to effect real change. But when done right, whistleblowing has strengthened democracy, protected the environment, and saved taxpayers and investors billions of dollars. Modern whistleblower laws have created a powerful tool for effective grassroots participation. Now, from the nation’s leading whistleblower attorney, comes the first-ever consumer guide to whistleblowing. 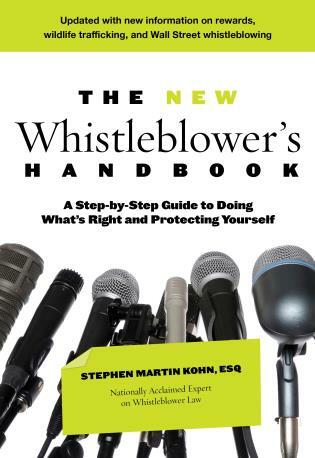 In The Whistleblower’s Handbook, Stephen Martin Kohn explains nearly all federal and state laws regarding whistleblowing and set forth twenty-one basic rules every potential whistleblower needs to know. The Whistleblower’s Handbook is the authoritative reference for anyone who has ever wondered how they might blow the whistle – and, once they’ve done so, how to prevail. Click "More Details" above for reviews, endorsements and media coverage for this book. Rule 16 : Yes, You Are a "Whistleblower"
Rule 17 : Beware of "Hotlines"